As I mentioned in a previous post – my sister has returned bearing gifts! She is doing a study program in Europe and has returned temporarily for the holidays. 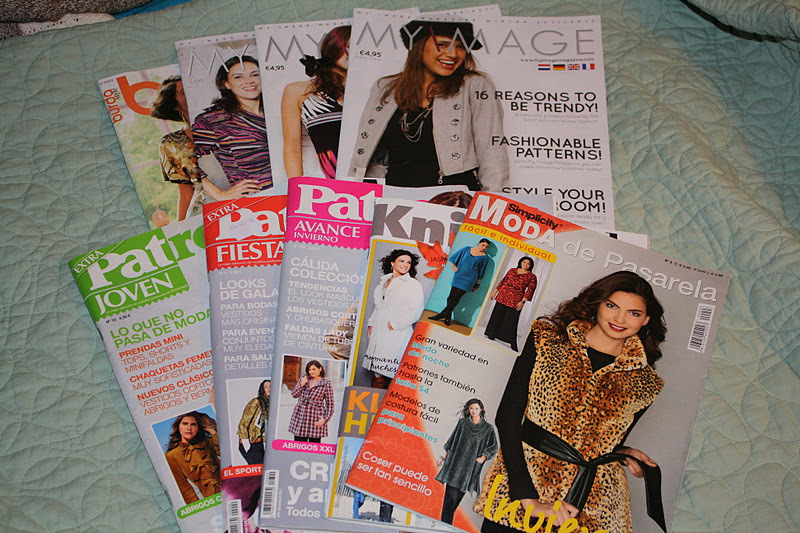 She has promised more after she returns, but thus far she has brought back 8 pattern magazines for me, along with a few other surprises. 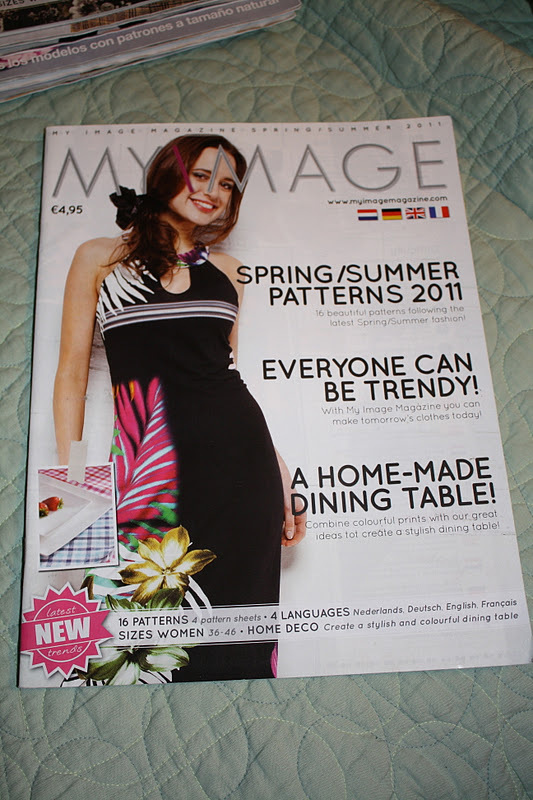 My new pattern magazines – My Image, Patrones, Knipmode, Moda de Pasarela, along with my January Burda. 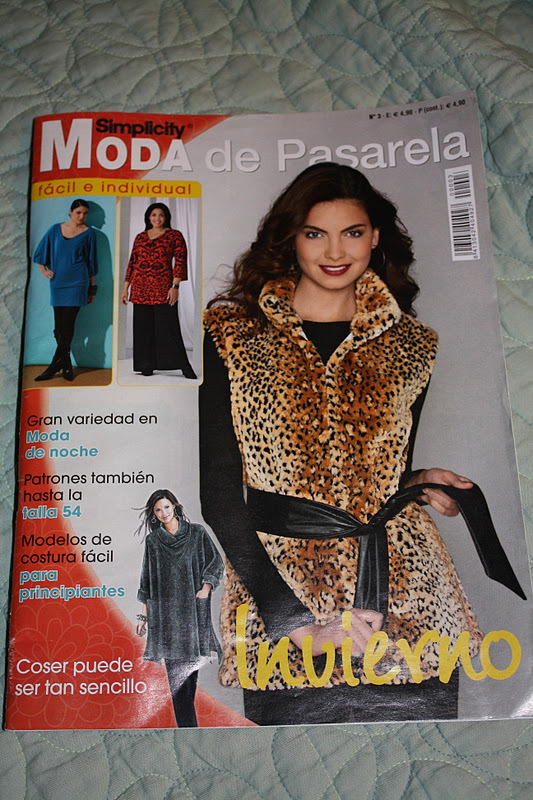 This first magazine is one I hadn’t heard of – Moda de Pasarela, which is apparently put out by Simplicity. 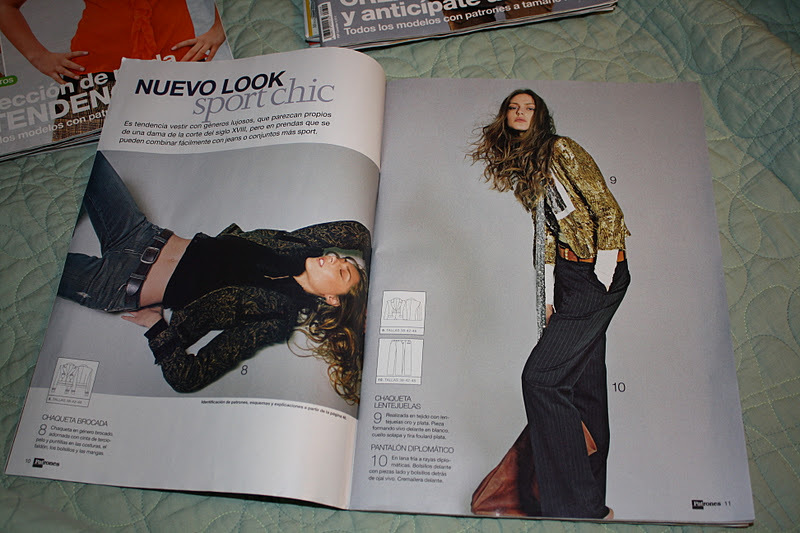 Moda de Pasarela from Spain. 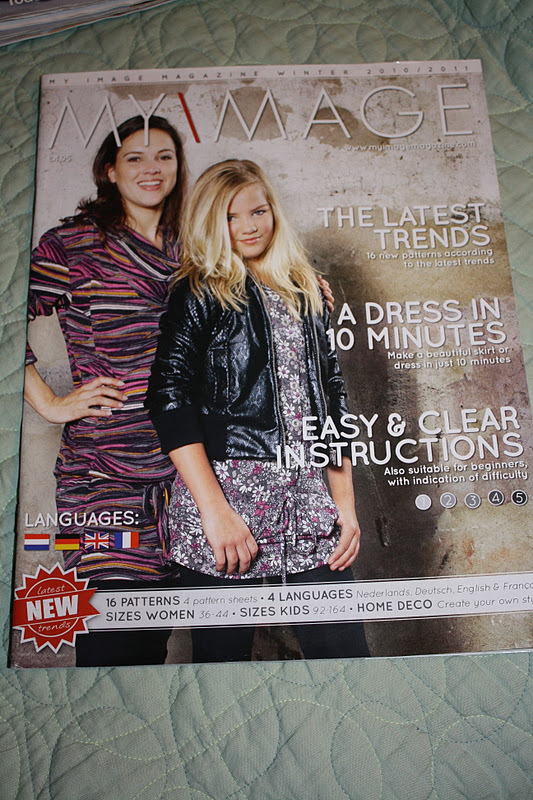 This magazine has patterns that are or have been in the Simplicity catalog, but for some reason I seem to find them more interesting in magazine form. I really like a lot of the jackets, and also a cute turtleneck sweater top. I actually already own this pattern. 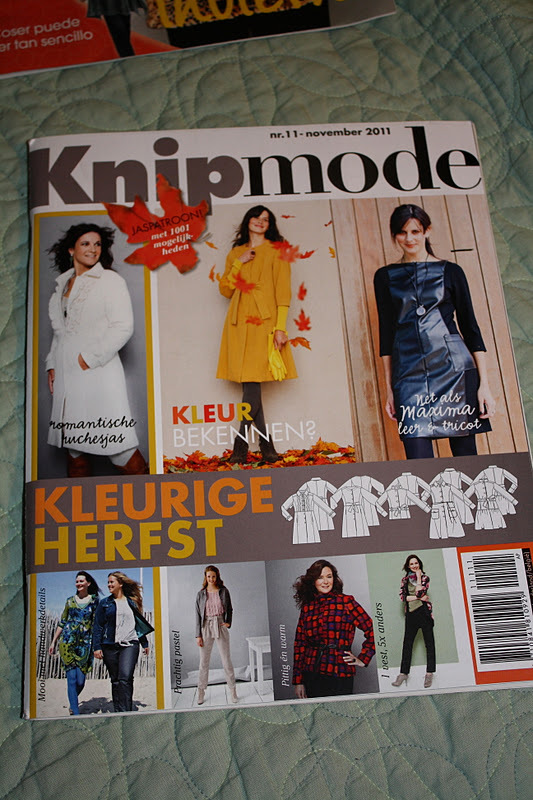 She also found the November issue of Knipmode. She plans on ordering some more Knipmode for me upon her return to school (yay!). 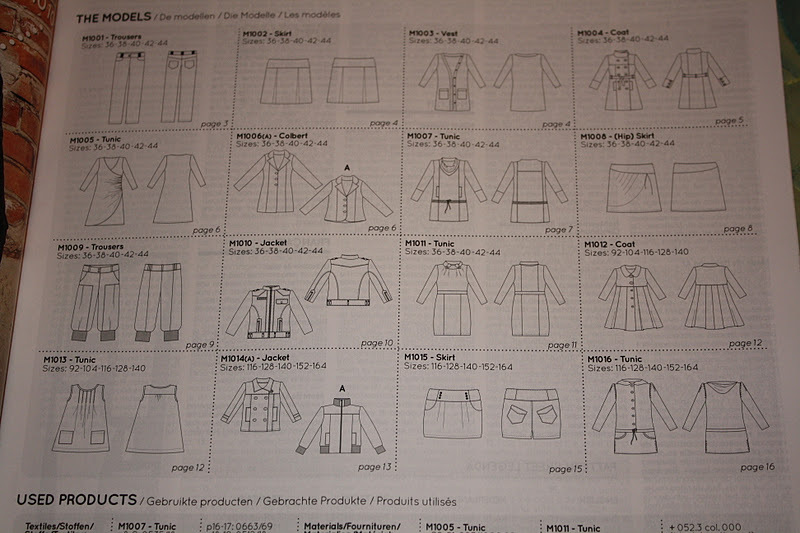 I love making jackets, so I am excited by this section – mix’n’match with collars, details, and sleeves. 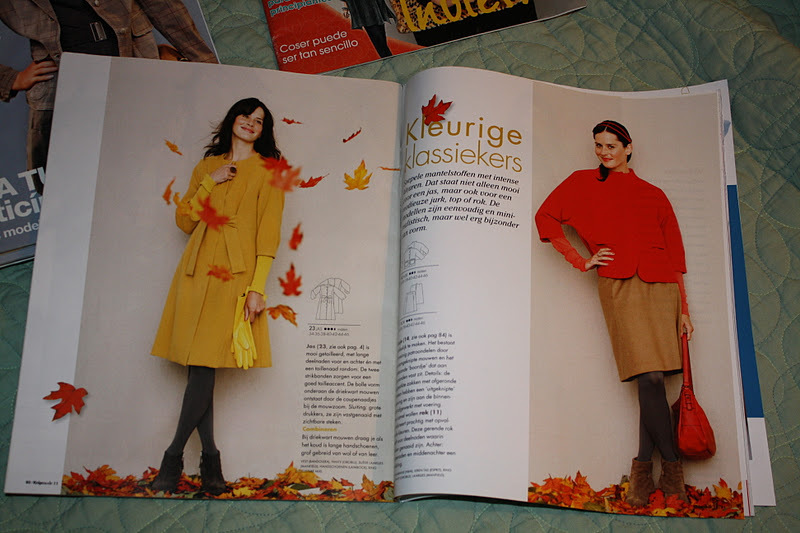 I also love this yellow coat that was featured on the cover. Although my sister is studying in a different country, she did manage a weekend visit to Spain – which, of course, mean Patrones. She found them (along with the Simplicity magazine) in Barcelona – she said that there are news stands along Las Ramblas, and that they all have some sewing magazines, although each stand had different issues available. 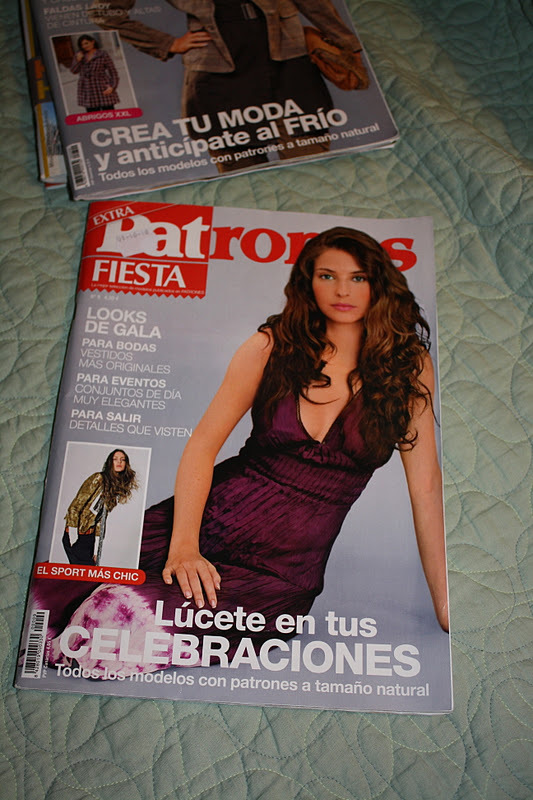 She also visited the beach town of Sitges and found an issue there inside of a rather large magazine store. 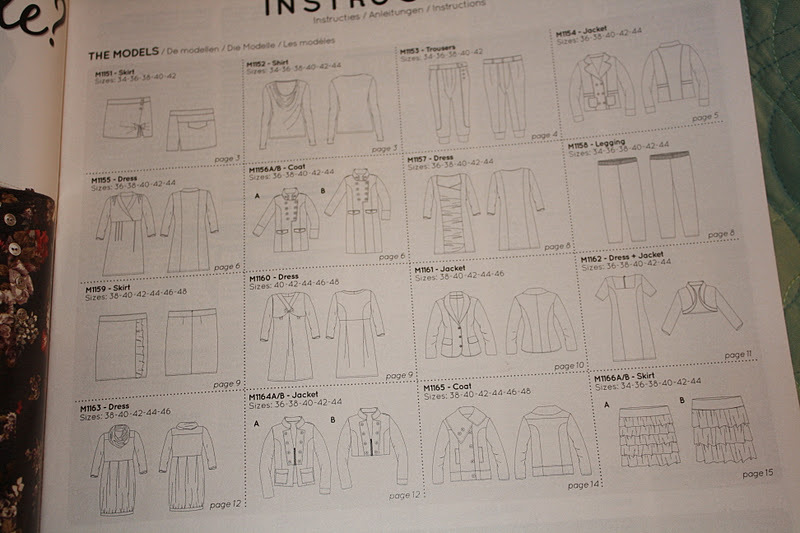 A shot of the pattern sheets – and I love this coat as well. 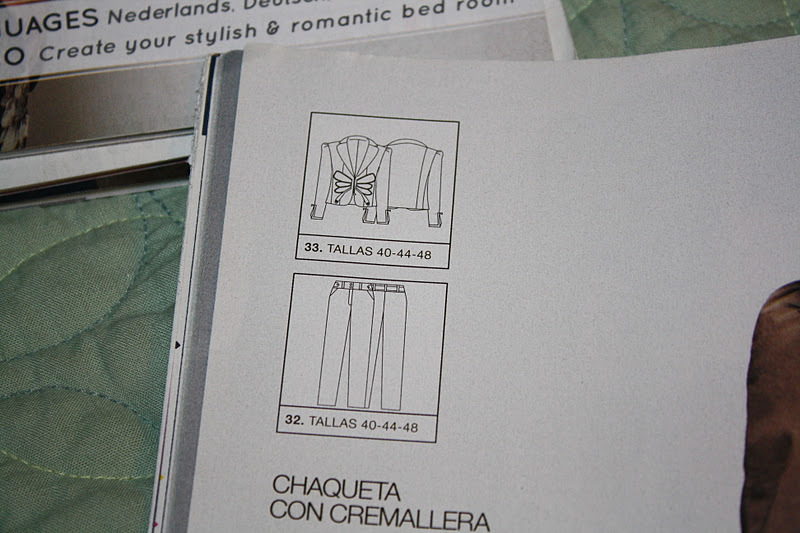 A look at Patrones instructions – in Spanish, of course! And I am obsessing over this goth jacket. 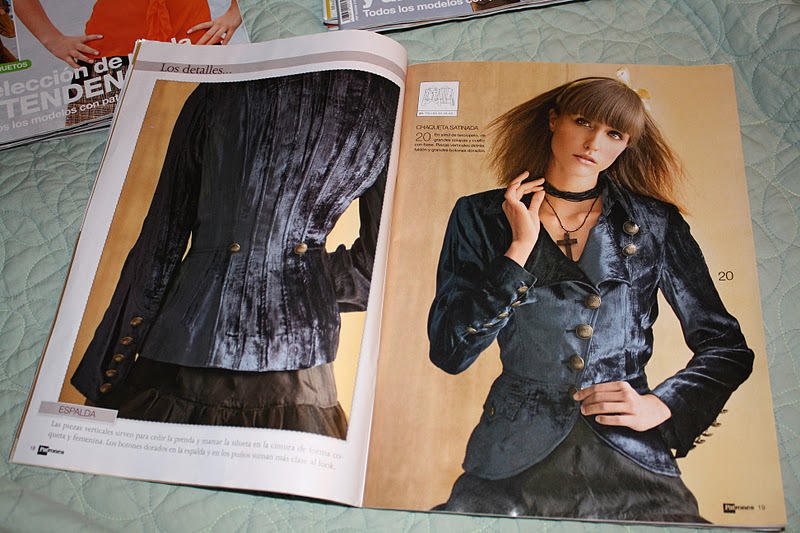 Love this classy coat; also a Spanish tutorial on bound button holes. And Patrones Extra Joven – No. 10. The line drawing on this jacket intrigues me. A bit more difficult to see in the photo, but I still really like it. 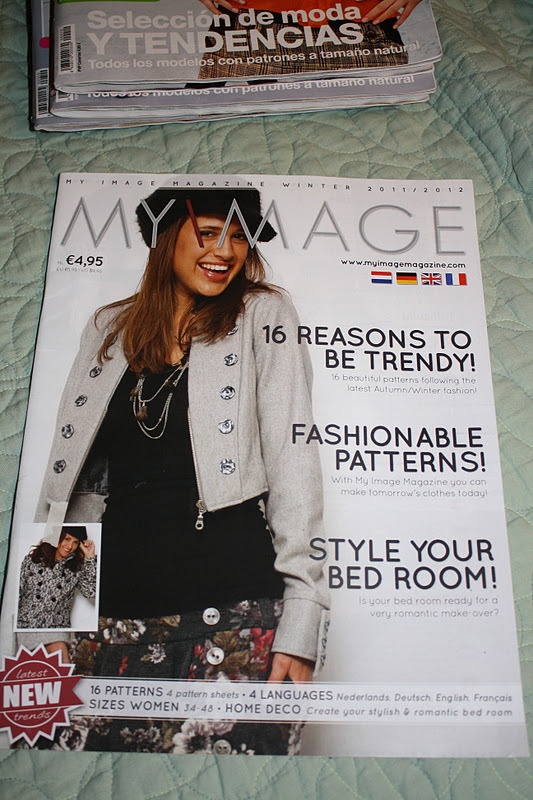 Also, my sister ordered me the full set of My Image magazines. 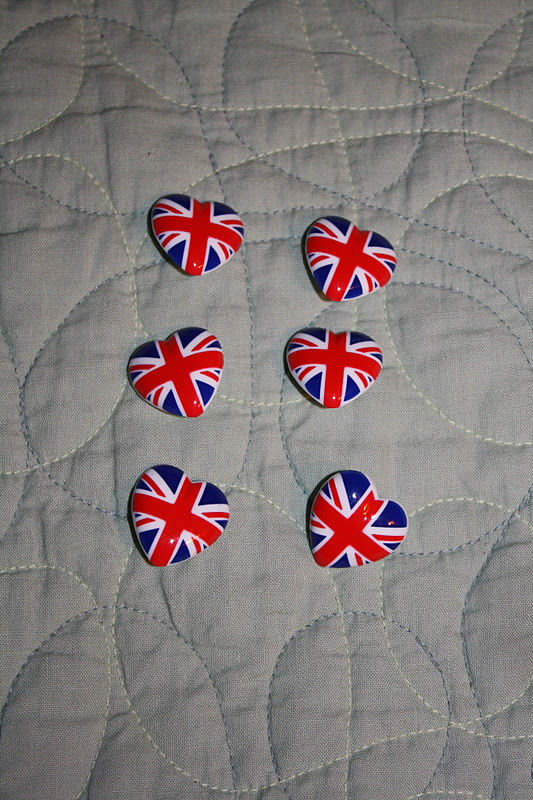 I could easily order these in the US, but it was cheaper shipping-wise for her to send them to her school address and bring them home than for me to order them here. Loving the cropped jacket and the dress on the left. 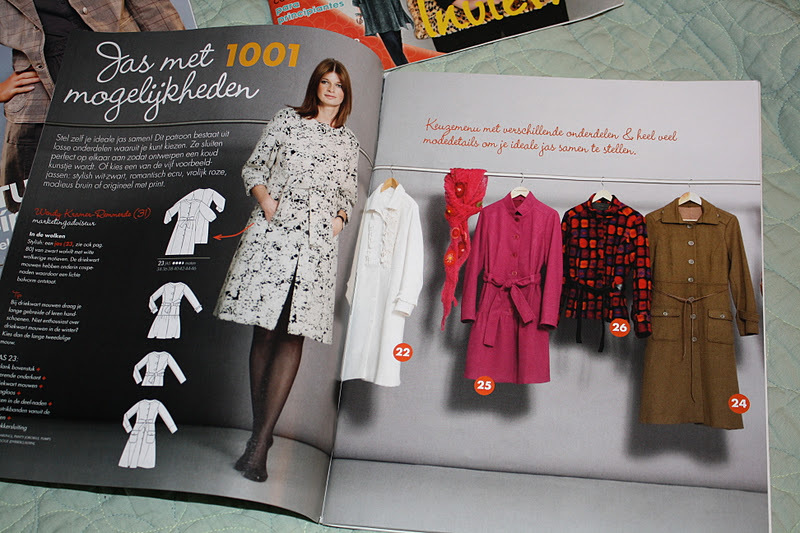 Not as many patterns as Burda, but I do like a lot of the jackets and dresses. 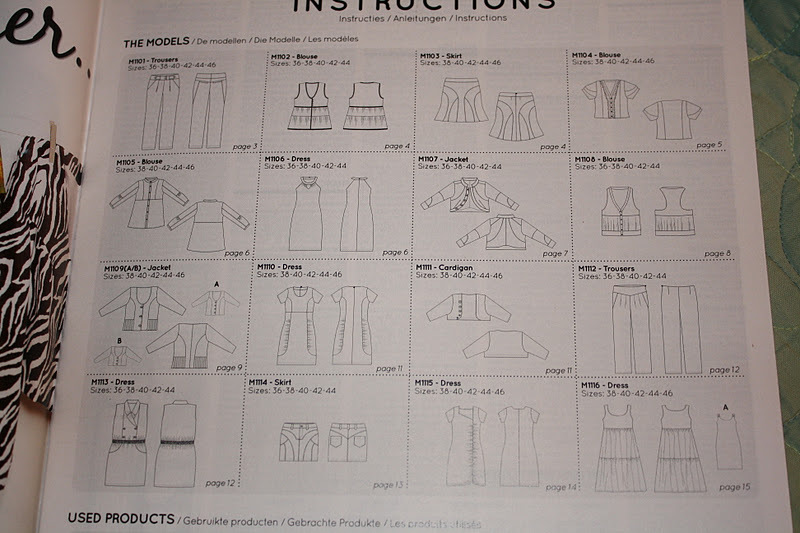 Picture of the instruction pages – each pattern has directions in multiple languages, including English. 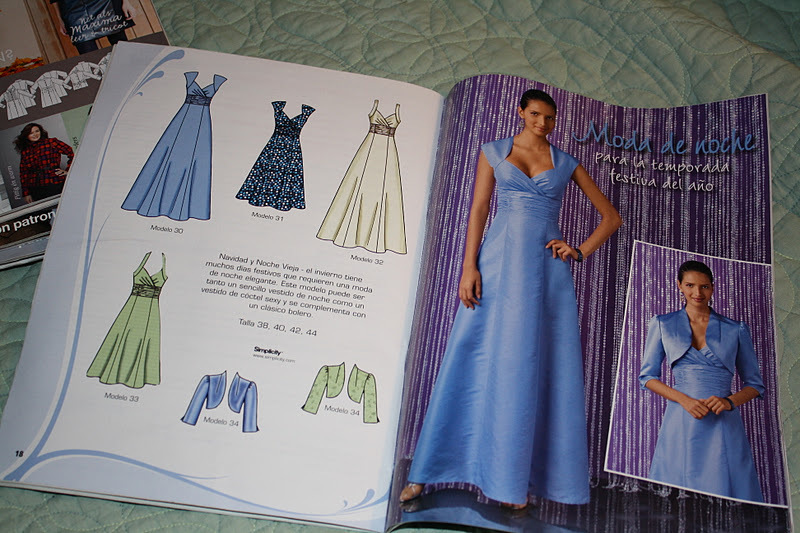 There isn’t anything in particular I am loving in this issue, but I could see making some of these dresses. 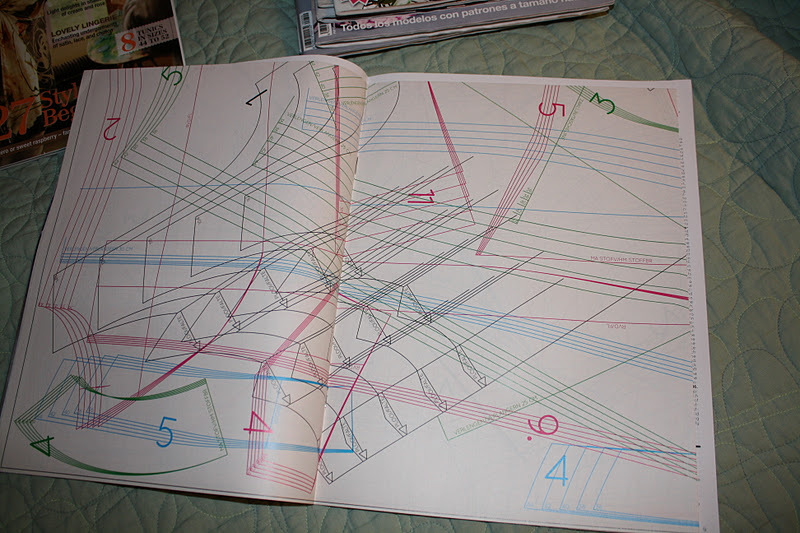 A view of the My Image pattern sheets. 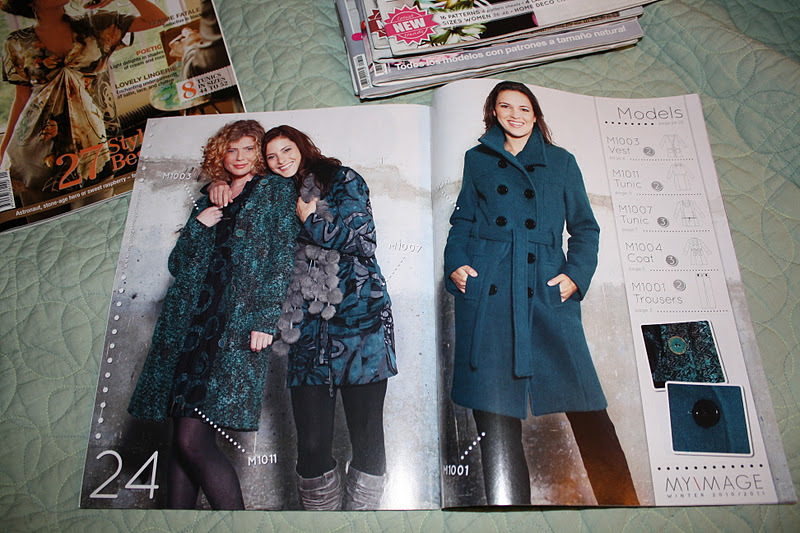 Love the teal coat on the right. I may need one of those. 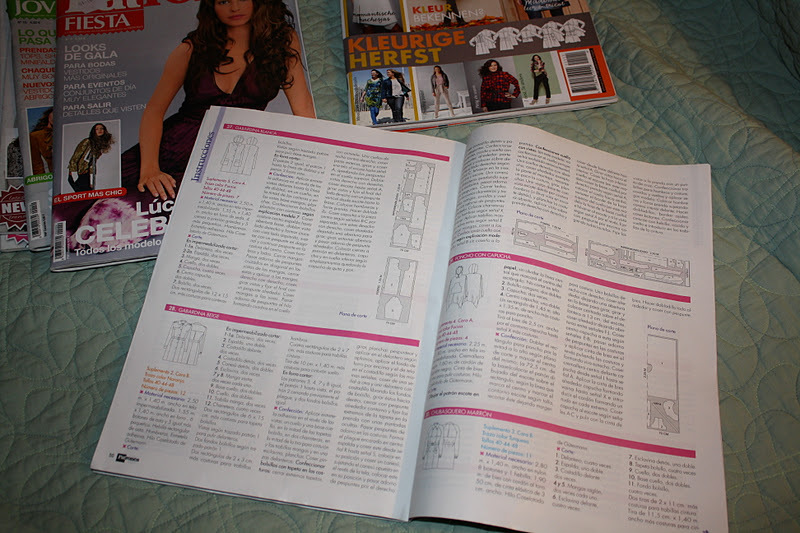 My overall impressions – I am super excited to have these magazines! 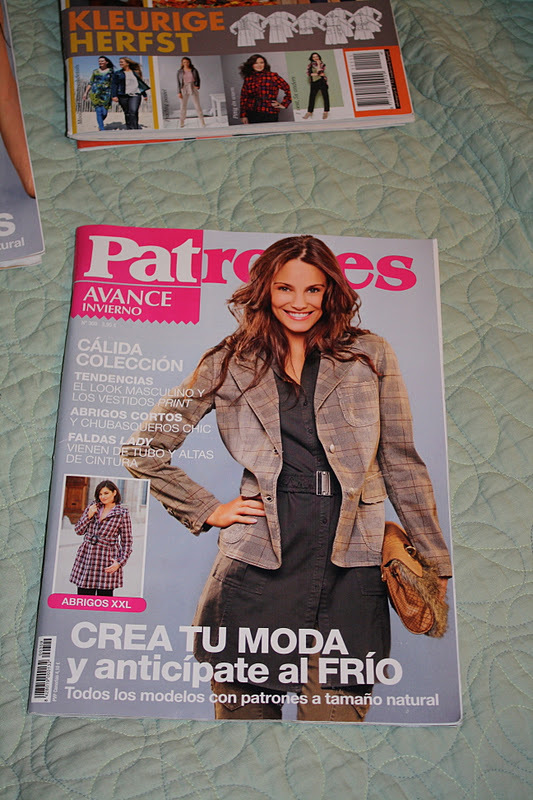 I love the patterns in the Patrones magazines, and I also really like the finished versions in the magazine. I think that they are really fashionable and I find them inspiring. I would subscribe if it wasn’t so crazy expensive, but I probably will stalk magazines on Ebay now. The designs in Knipmode are good, and I like a lot of the jacket designs, but I wasn’t too excited by much else in the magazine. I don’t know if I would go out of my way to get more magazines, but I will be excited if my sister can get more while she is in Europe. 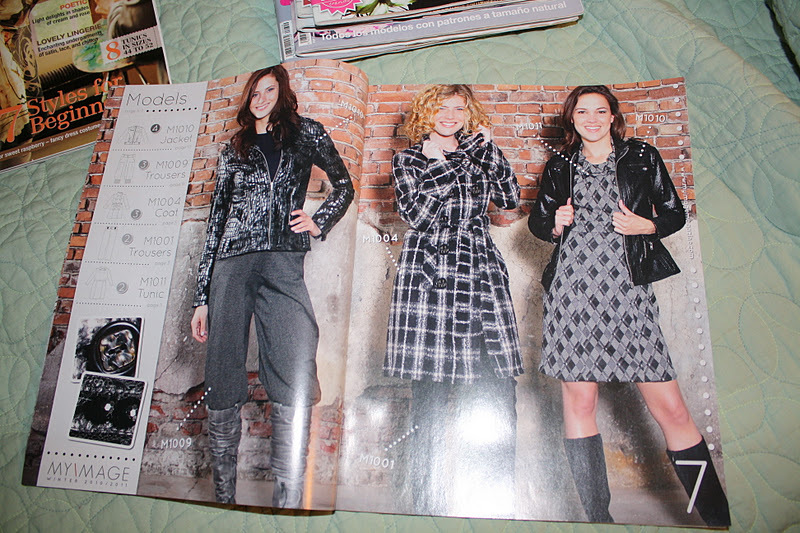 Similarly, I really like dress and coat patterns from My Image, but I wasn’t too excited by the pants or tops. Also, a lot of the finished designs are made it bold, crazy prints, so it is a bit difficult to see how the design really looks made up, although I do love a lot of the fabric they have used in their designs. Also, I appreciate that they make the designs in several versions, and all of the clothes in the magazine can be made with the enclosed patterns. I think that I might consider ordering their future Fall/Winter issues, but I don’t know if I would order their Spring/Summer issues. 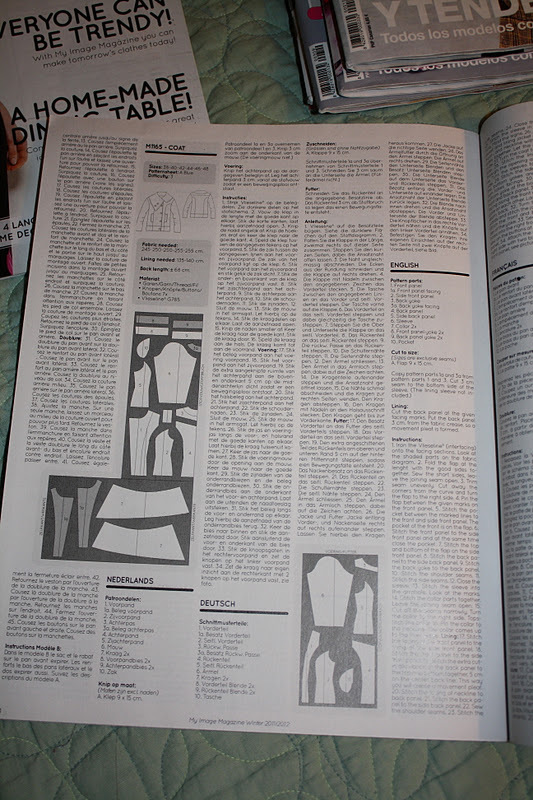 I have heard that one should go up a full 2 sizes from Burda to Patrones – anyone tried My Image or Knipmode? How do the sizes compare? I will need to take my measurements in centimeters regardless, I’m sure. 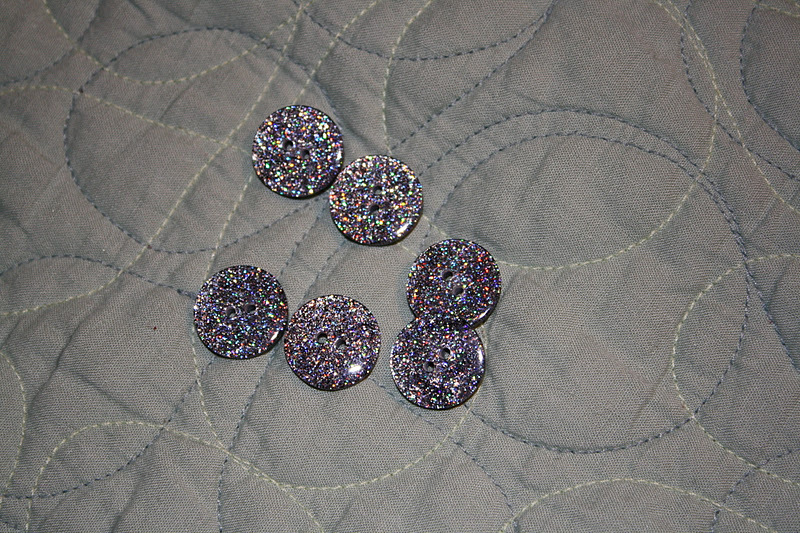 She plans on getting me a few more of the glitter buttons when she goes back, and I think I might pair them with my shiny cotton I recently got from Joann. Very excited! And, as if all this wasn’t enough – my new sewing space has finally been set up! It isn’t anywhere near being finished (there is much that needs to be re-housed, so my sewing books and notions can live on the nearby shelves), but the machines are set up and I can sew! I am hoping to get some things sewn in the next few days, so hopefully I can get some finished objects posted before the end of the year. Love your blog! 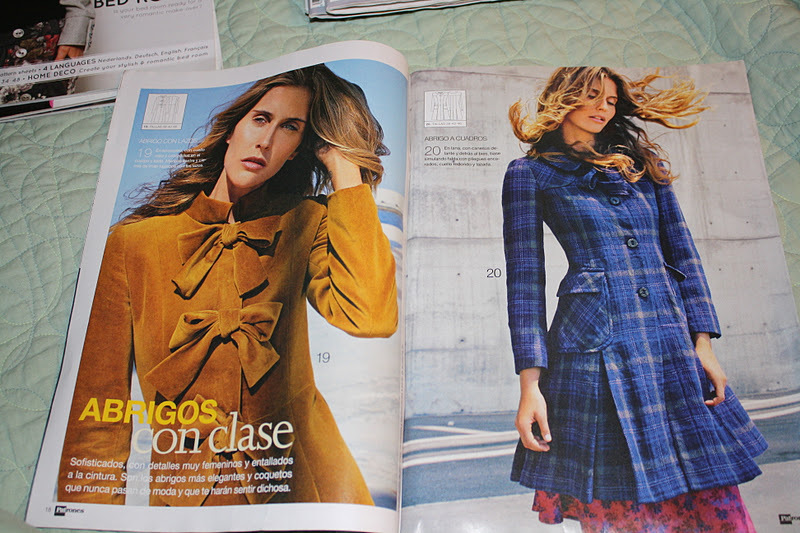 I noticed other bloggers buy Patrones and other non-English magazines for the patterns. I've never seen one in real life. Are there English instructions for any of the ones you have above? If not, is it fairly easy to follow? Thanks! Always glad to know someone else enjoys my ramblings. 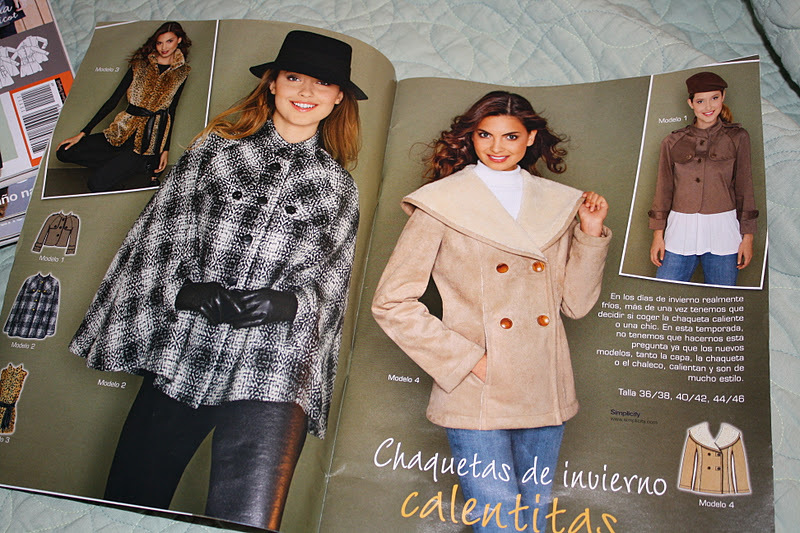 As for the pattern magazines, BurdaStyle and My Image both have English instructions (Burda you have to find the English version of the magazine, My Image contains all instructions in all languages). Sometimes the Burda translations are a bit odd sounding and some people really can't deal with them. 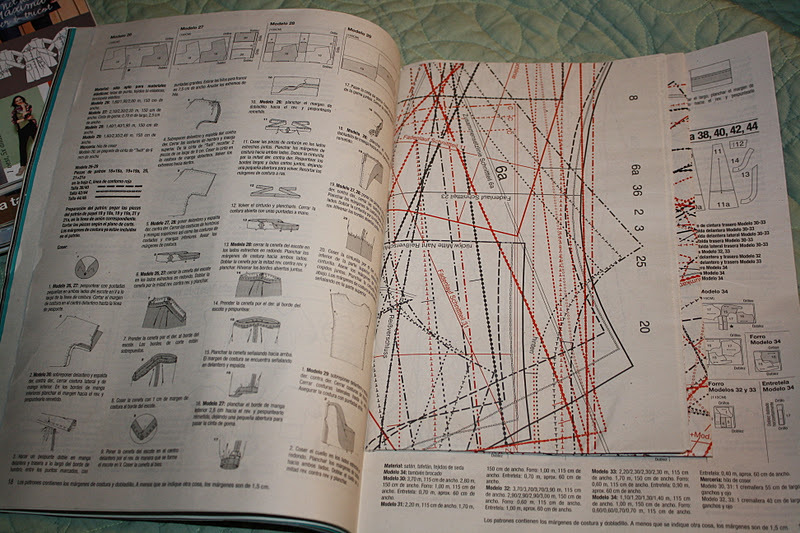 I can usually puzzel out what they want, but often when sewing with Burda it is good to have additional sources to help with construction for more involved projects like jackets and coats. 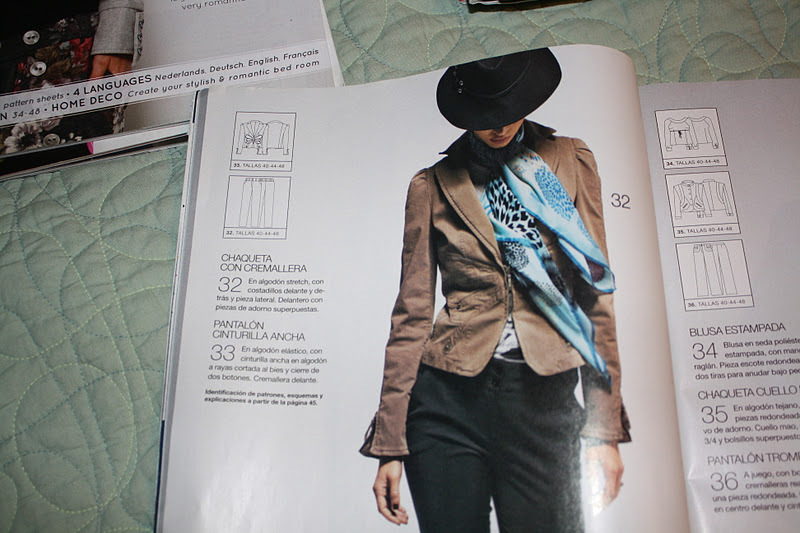 Patrones and Moda de Pasarela are strictly in Spanish. I took Spanish in high school, and despite the years that have passed I can actually muddle through reading a lot of it, though I would probably use google translate to help with the instructions if i were doing anything that looked particularly complicated. I really like the styles in Patrones and might consider trying to figure out a subscription at some point in the future, but I think I want to actually test out some of the patterns before I make a large financial commitment. 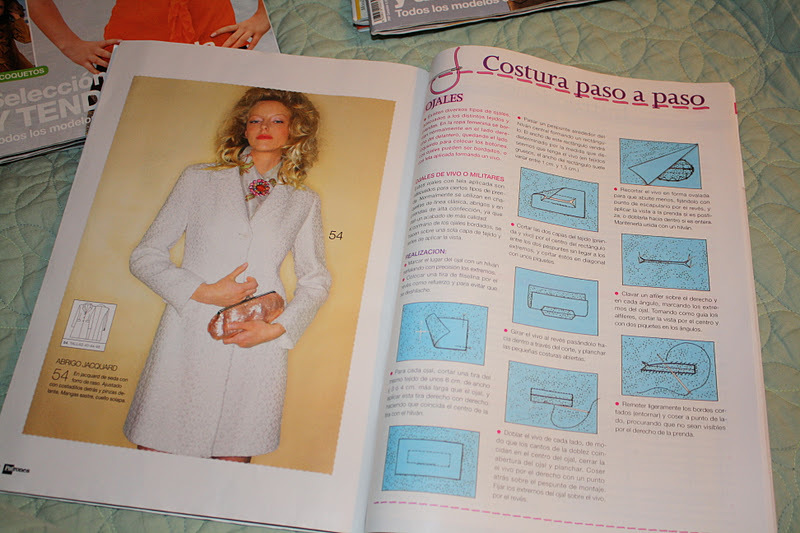 As for Moda de Pasarela, the patterns contained inside are all Simplicity patterns (for example, mine contained 2285 and 2442, among others), so these can be more easily bought as envelope patterns with English instructions at a fabric store or from the Simplicity website. My sister got it for me as more of a novelty item, though I do intend to trace out some of the magazine patterns and not buy them again. Knipmode is 100% Dutch, which is very alien looking. For those I will definitely be using a LOT of google translate, even for figuring out notions and other things I need to start one of those projects. (I first ordered from this website when I didn't want to commit to a subscription and the service is lovely, the owner always sends a handwritten note with purchases). My sister ordered from their website but was in Europe at the time, so I am not exactly sure how the international ordering works in the US, but the website it very clear and in English so it should be ok.
As for the others, I have found some online sources, but have not tested them, so I am a bit hesitant to recommend. For all of these it is possible to find older issues on Ebay (usually around $20 each, though sometimes you can find them for a bit less or more as well). 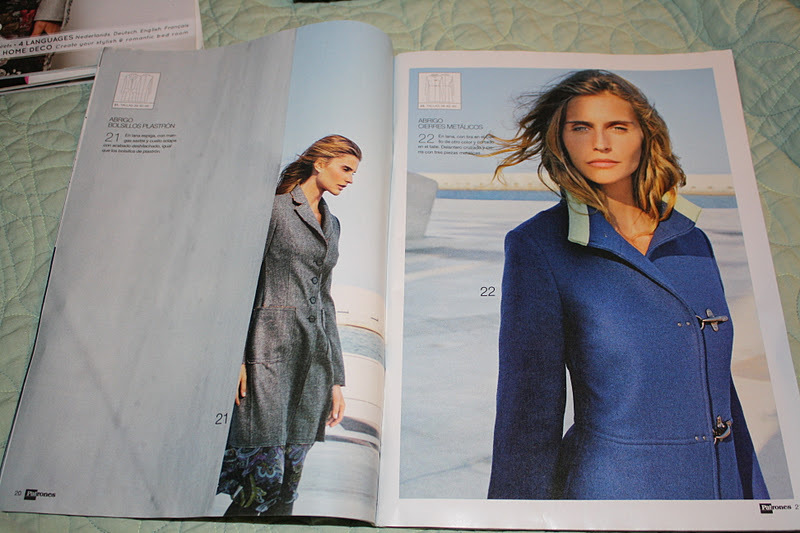 I have found a lot of my beloved Burda back issues on Ebay, so it can be a great source for some of the older stuff.